Anyway, when I first started designing, I was not very sure of myself, so I looked to others for guidance in creating my designs. 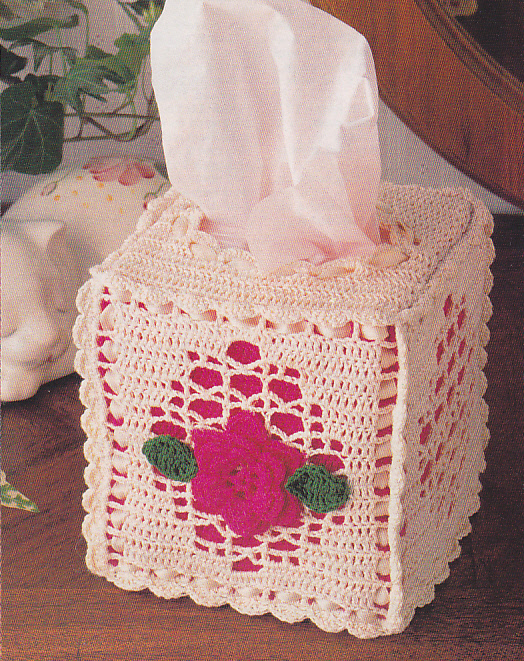 When the Design Coordinator of Annie's Attic asked me to make a tissue box cover, I asked her what she had in mind. She said something like, "Oh, you know, something colorful, with filet crochet, Irish roses, ribbons, something like that." Of course she meant I should use one of these things, not all of them, but in my beginners zeal, I went all out and incorporated every single thing she had mentioned into my design. This little tissue box cover was the result, and I am amazed that they actually bought and published it. I have found that a lot of designers think they have to go all out, and do weird and unusual things in order to make their designs special. But in reality, the best designs are those that achieve beauty through simplicity, and they are a lot easier and more fun to make, too. Really great powerful point! I think it's tempting to feel that you have to push the boundaries to get noticed but the real trick is finding a way to infuse an item with your own creative slant without overdoing it, as you've said. And that's why I always look forward to the Annie's Attic catalog! I love making projects that are challenging. None of that namby-pamby crochet for me!